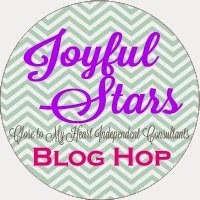 Welcome to the Joyful Stars March Blog Hop. If you came from Jolene's Paper Trail Blog you are on the right track. It is a circular hop so you can start anywhere, but you can find a complete list of blog participants on Joyce's Blog. 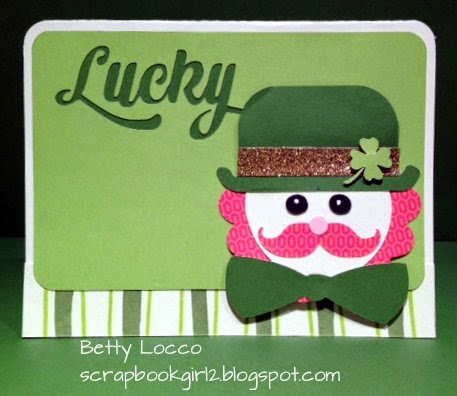 Today, I am sharing a card made for St. Patrick's Day. It was inspired by samples on Pinterest. Use Alcohol markers GY234 Leaf Green and GY235 Sap Green to draw lines on Colonial White Cardstock. Cut 1” strips and adhere to bottom of card front. Now, it is time to hop on over to my friend, Krista's Blog to see her creation. Happy Hopping! Great way to show how versatile our cartridges are. I love that you can mix and match the cuts to create your own masterpiece. Cute Card Betty. Thanks for sharing all the cricut cuts. Love this! Clever use of Cricut cuts.